SACRED SPACE: Outdoors or in a large room floral arrangements are used to define the space where the wedding vows are to be exchanged. At Kiana Lodge Paulsbo WA. The wedding arch defined the sacred space where the vows were exchanged. The wedding took place on Palm Sunday so I used palm branches for the background. The roses were from the wholesaler and were not organic. I ordered 125 roses. 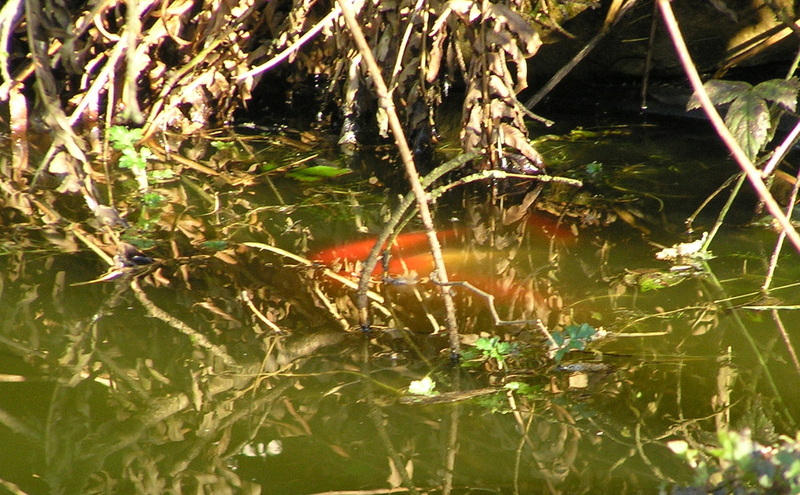 The arrangement was constructed at home and transported to the site. This wedding took place on one of the hottest days of the year. The bride and groom chose this shady grove as the place to exchange vows. 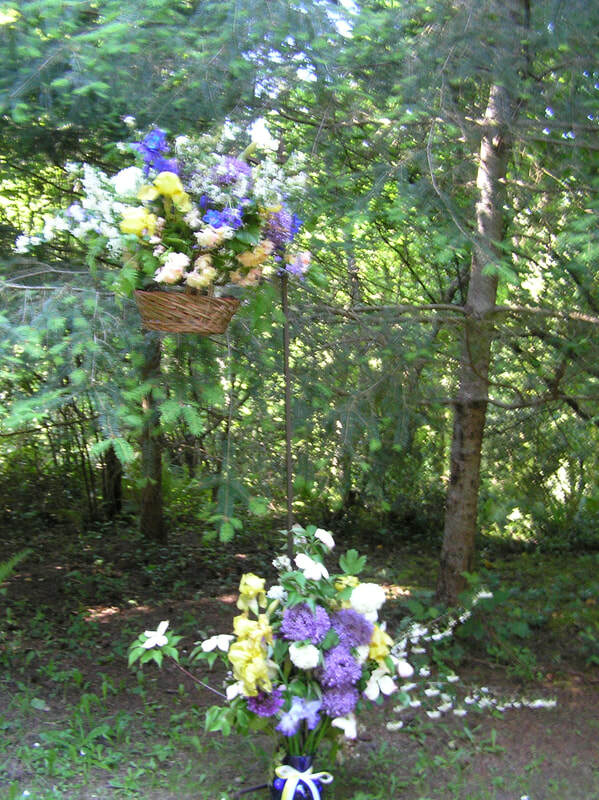 I used shepherds crooks to hang baskets of flowers. 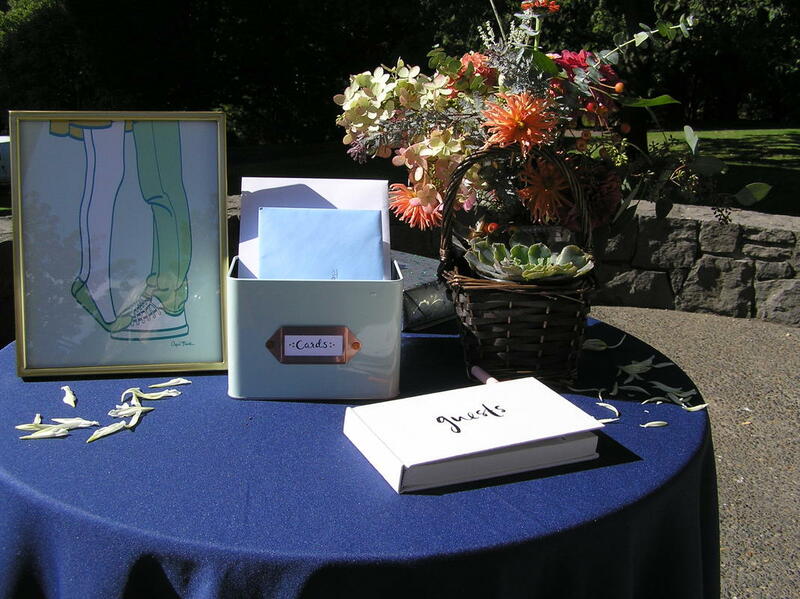 Under the baskets we used blue vases with flowers to created an intimate feeling for the the exchange of vows. 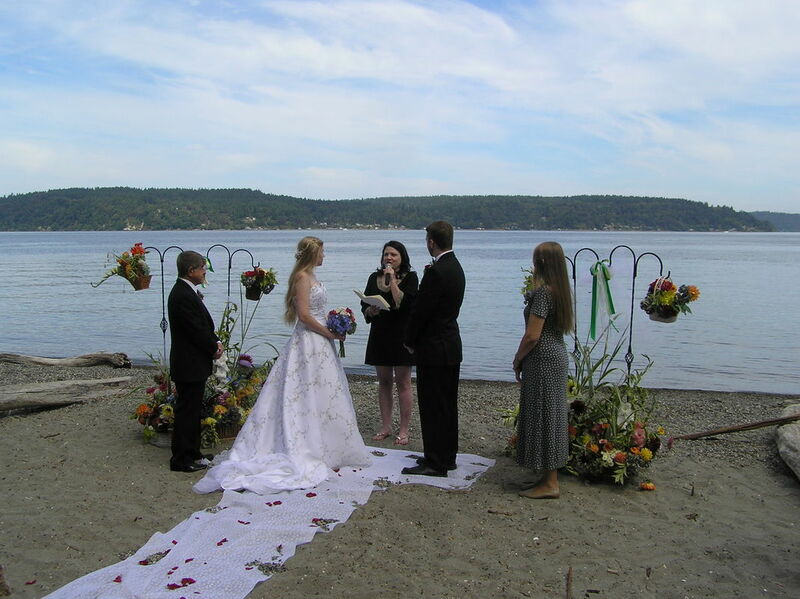 This beach held special meaning for both the bride and groom. The challenge was to define a private place on a public beach. I used masses of flowers. I originally wanted to use blues and greens to reflect the natural colors of the scene, but the bride loves bright colors. RECEPTION: For the reception area we are faced with lots of challenges. 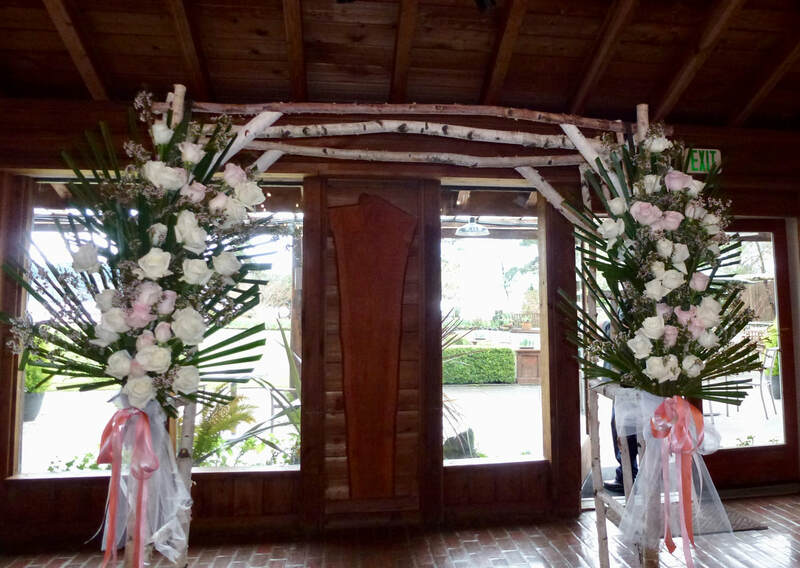 We're asked to to wall hangings, table bouquets and bouquets for the buffet table. Table bouquets must be short enough that diners can see the person sitting across from them. If you must use mason jars for the table, use pint jars with a narrow mouth. Mason jars are a challenge because they don't have pleasing dimensions. 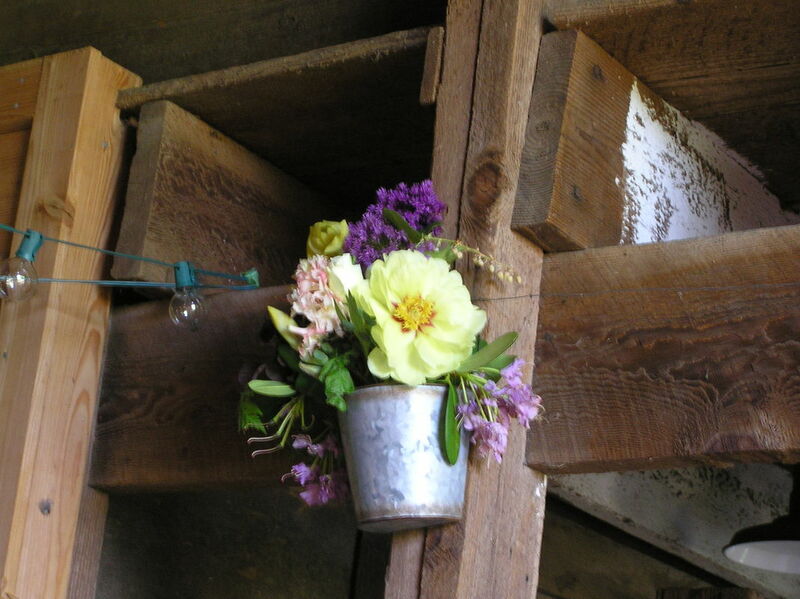 This is a wall arrangement in a barn. For me this arrangement felt too high on the wall but we were not allowed to add hooks or nails. On the other hand taller people thought this was just fine. We wrapped the post this was on in wisteria vine. These arrangements served double duty. Massed together they formed the sacred space. Once the vows were exchanged they were moved to tables for the reception. This small arrangement gave the buffet table a completed look. This was an outdoor reception in April. Weather and flowers cooperated nicely. These arrangements were for the beach wedding. 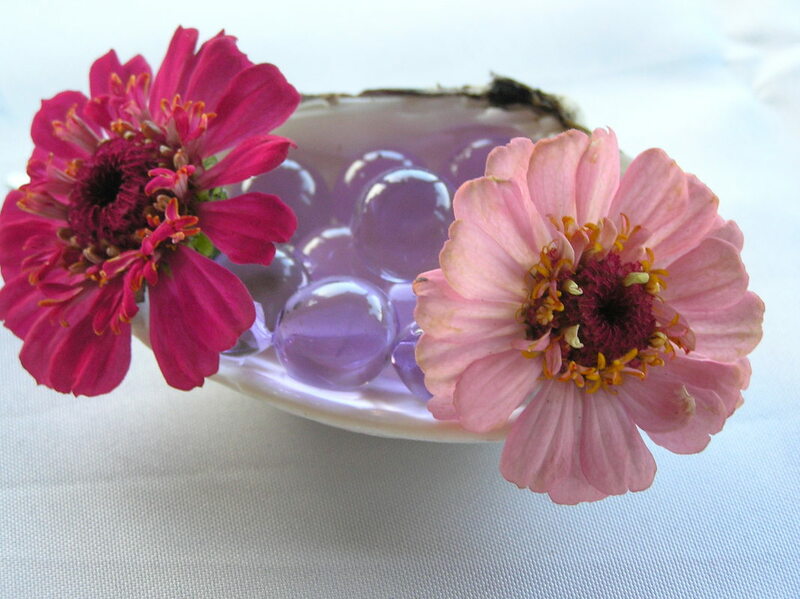 While I massed big flowers on the beach, I chose just a couple zinnias in clam shells with water holding beads for the dining tables. The table also had plastic confetti strewn down the center. The groom's brothers and friends amused themselves by stuffing confetti into the water holding beads and pretending it was dinosaurs preserved in amber. Yes, these were grown men. 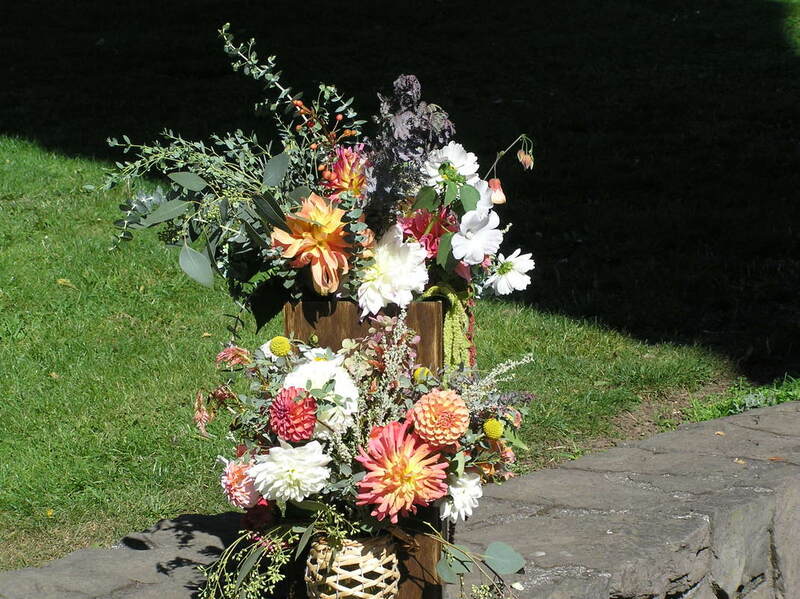 This basket with a table sized arrangement in one end and an a live potted succulent in the other tied the table with the guest book to the rest of the wedding, which was down a long flight of stairs from this table. BODY FLOWERS: Order a couple extra. One of my most horrifying stories is of the rose that popped off the groom's boutonniere when someone bumped into him. I'd made a spare so all proceeded nicely. Herbs and succulents are popular right now, but about anything goes for body flowers. I used hop flowers for a group of groomsmen who were into brewing beer. They loved it. 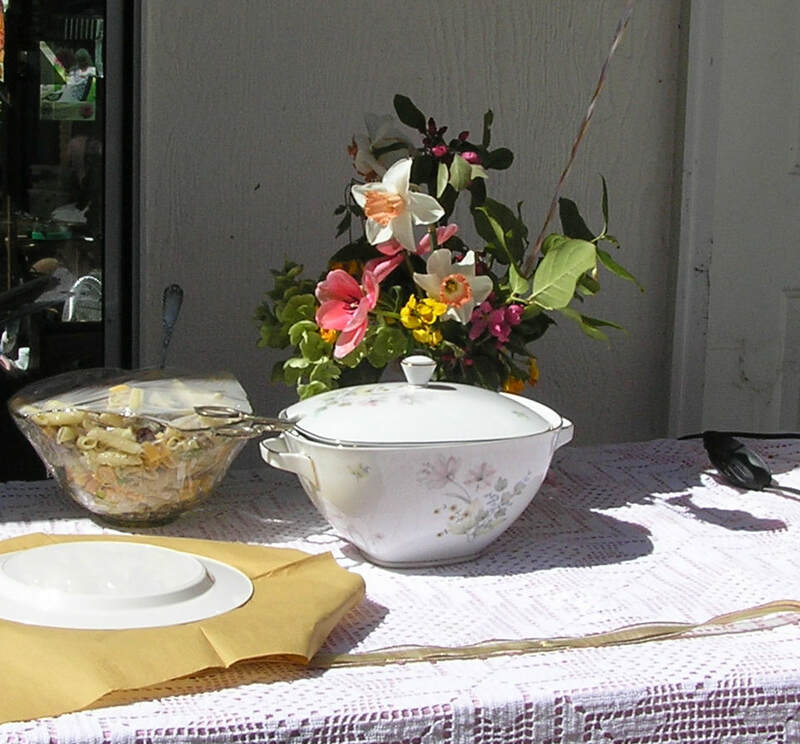 In case of disaster, table arrangements can be grabbed up to substitute for the bride's maids. While brides love a sunny day for their wedding, their flowers prefer misty and misbehave in the hot sun. For the bride who loved peonies and got married before they were in full bloom. 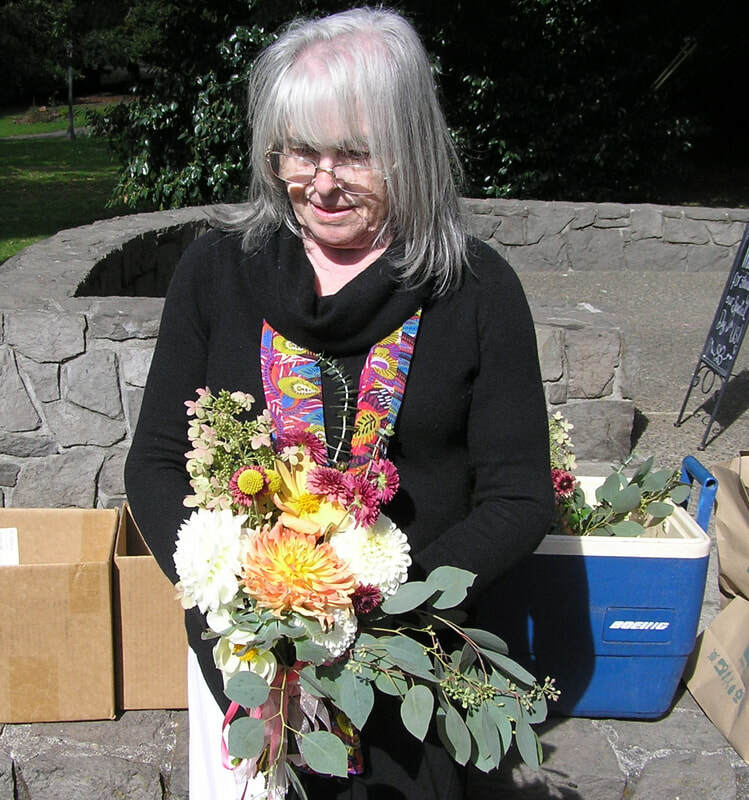 We provide organic, locally grown, seasonal flowers. I did have two large red peonies that bloomed in time for this wedding. Greens were Sweet Cecily, and I used allium and snowball to round out this woodland style bouquet. Single peonies with larkspur for the bridesmaids in the woodland wedding. 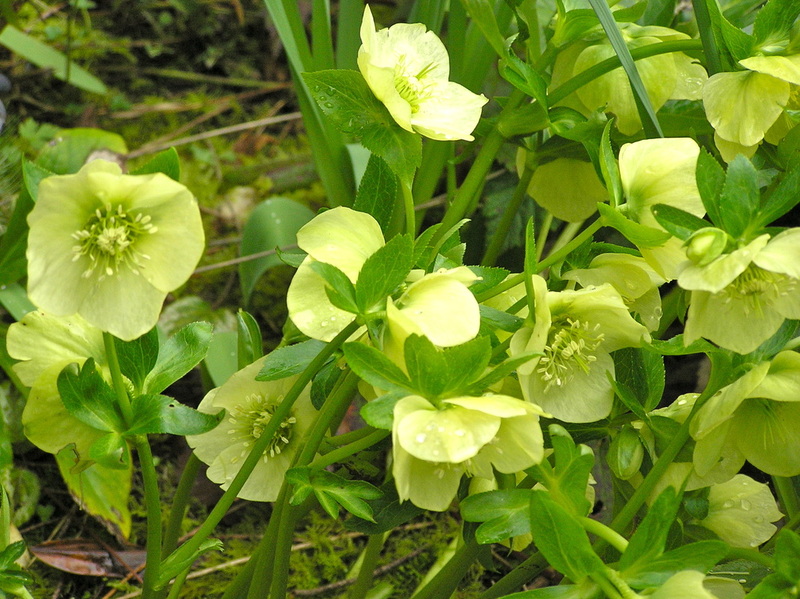 Generally, single peonies bloom before doubles except for tree peonies. Flower crowns take way more material than you would think. This crown was for a twelve year old with red hair. Yes, she looked glorious. 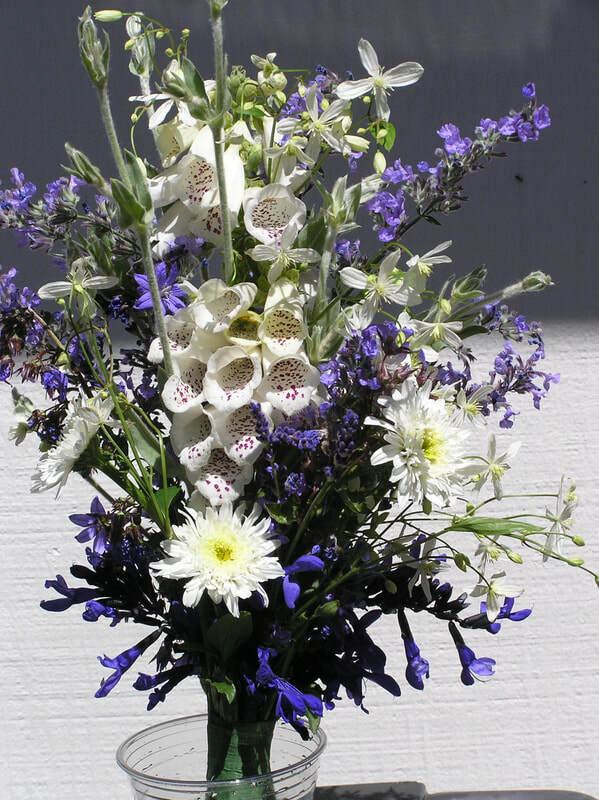 This is a mid-summer bouquet. The foxgloves are small side shoots off a big plant. They are just the right size for a bride's maid. 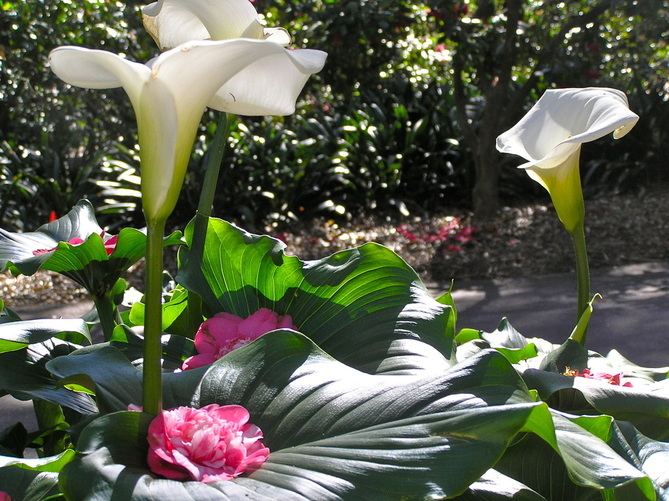 For the woodland wedding I was happy to have these callas. They're indestructible. This spring after Hubby fell off of the garage roof. I hired a young man, Seth to do the chores Hubby wouldn't have done if he hadn't fallen. After all they had not been done in the past two years. The keyhole garden was one such chore. Seth cleared weeds and made a solid foundation for the concrete block walls of the bed. Zinnias, glads and dahlias are growing rapidly in the deep bed. Pink is a popular color this year. Every color seems to take it's turn at being everybody's favorites. Here are some of my favorites. 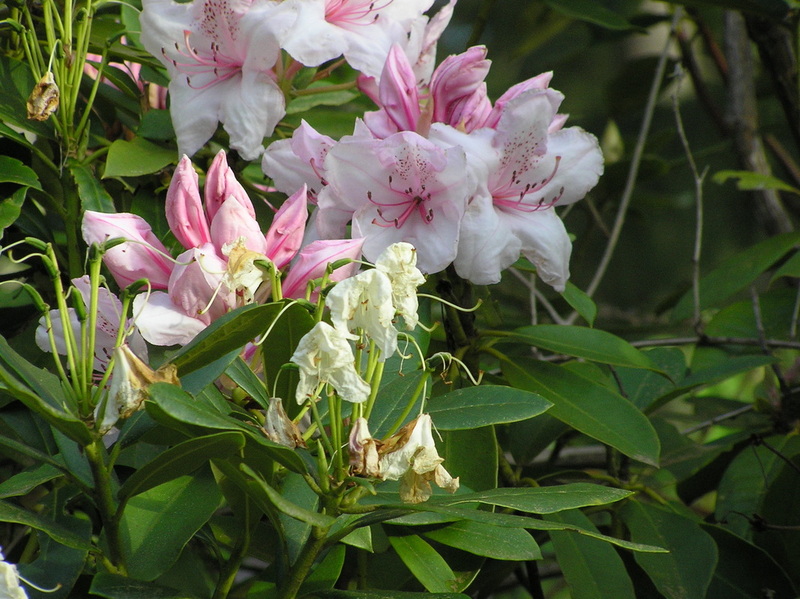 Mother of Pearl is an old Rhody but its color is pleasingly delicate. 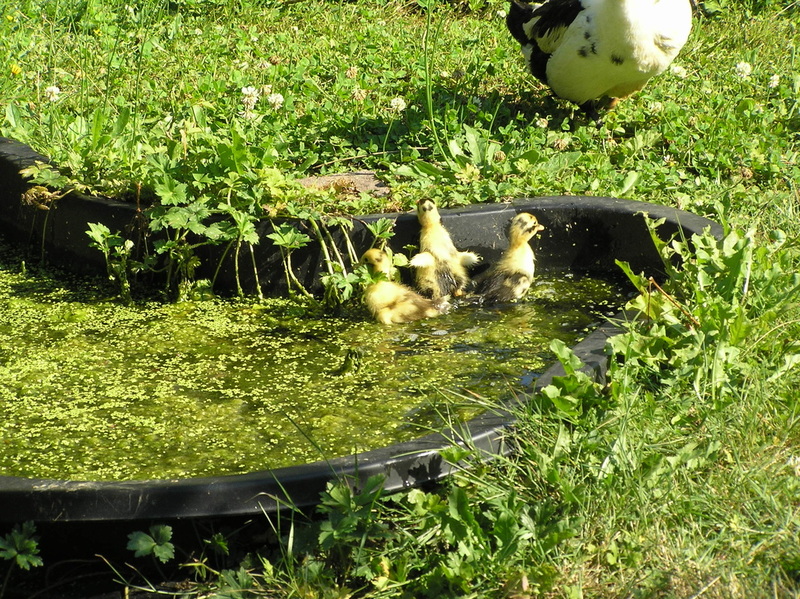 2014 baby ducks in big pond. 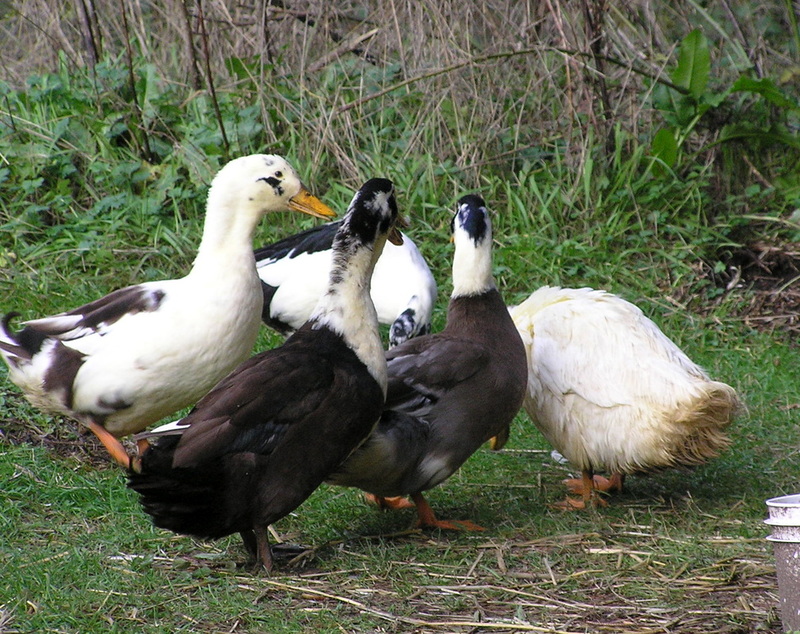 We have ducks to control insects and slugs. Last year Mama Duck hatched three daughters. I'm afraid that this year the eggs were not fertile. Poor Mama duck. 2015 adult duck in the fountain. 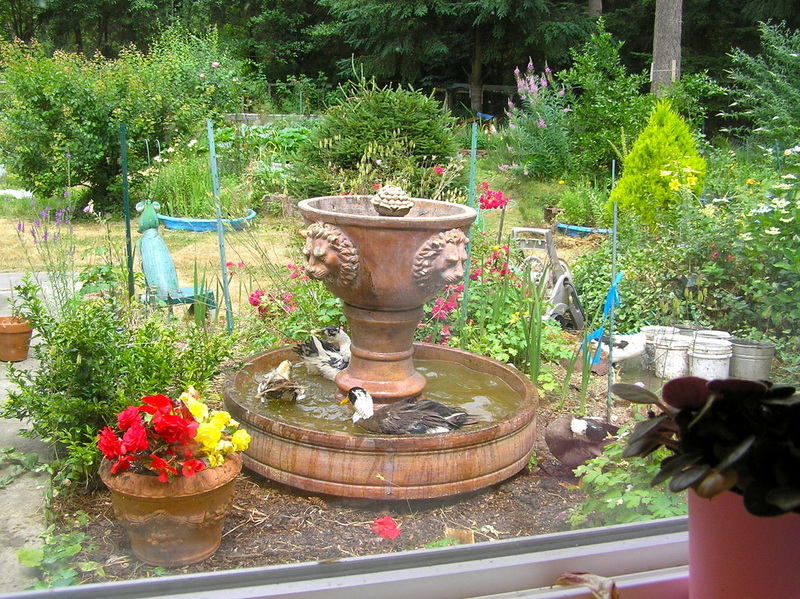 Aside from the duck being in the fountain the view from my kitchen window has been pleasing this summer. I love doing weddings. 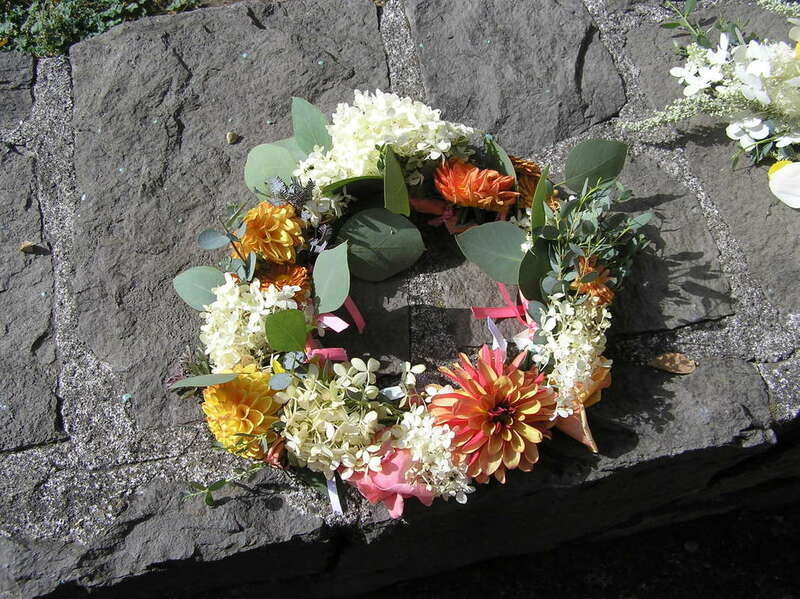 All of the flowers fro Abby's wedding came from my garden. I didn't know what to think when her mom said Eggplant and Cream with Pink were the colors. I have a rose Midnight Blue that is the right color and the dahlia Diva came through for the deep purple. Bride's Bouquet for Abby McKinney. Midnight blue roses, mix of white roses and mixed pink roses. Here is my Easter arrangement in the sunlight on our patio. It is 40" tall not counting the dangly bits. This is my arrangement for Easter Sunday. I called it abundant exuberance. I used a palm branch from my garden as background, and added masses of red and white flowering currant. I like the way the clematis armandi dangles and its white flowers have a pleasant citrus scent. You can find some euphorbia in there and of course the daffs. Many of the daffodils are doubles. The arrangement was 40" high by about 30" wide. 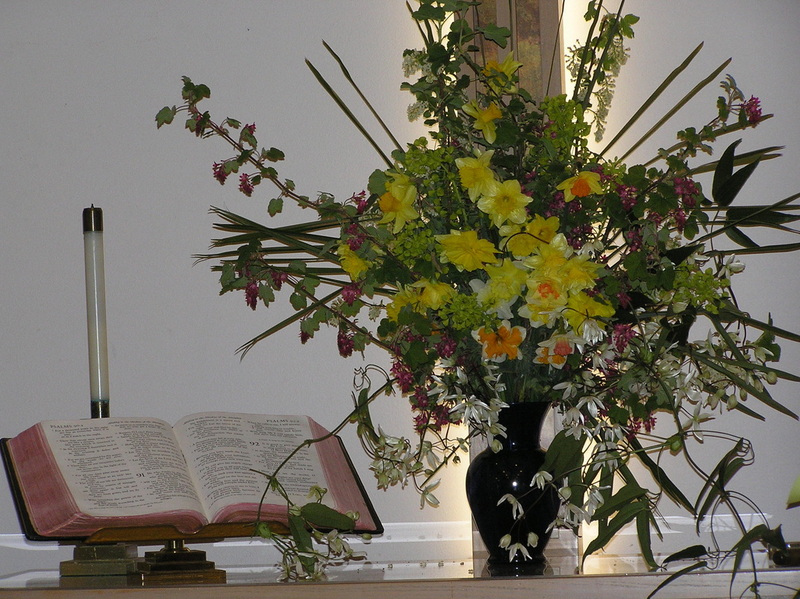 It is a challenge to construct an arrangement big enough to suit the front of the sanctuary. In the past, I've brought in 15-20' trees. This is my pink bed in March. 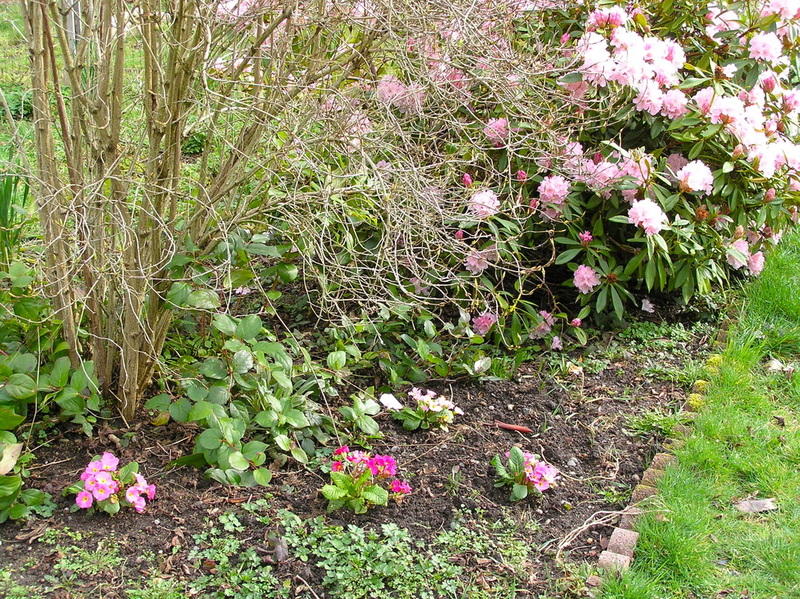 I just added the primroses this year. Usually the bed has tulips. The deciduous variegated weigela adds a long season of interest to this corner of the garden. I was wandering around the garden looking for things to photo. The side of our garage is not usually a dramatic object. I wish I had a water feature like this at my house. A well designed garden is interesting even in winter. I love the gnarly old tree in the foreground. 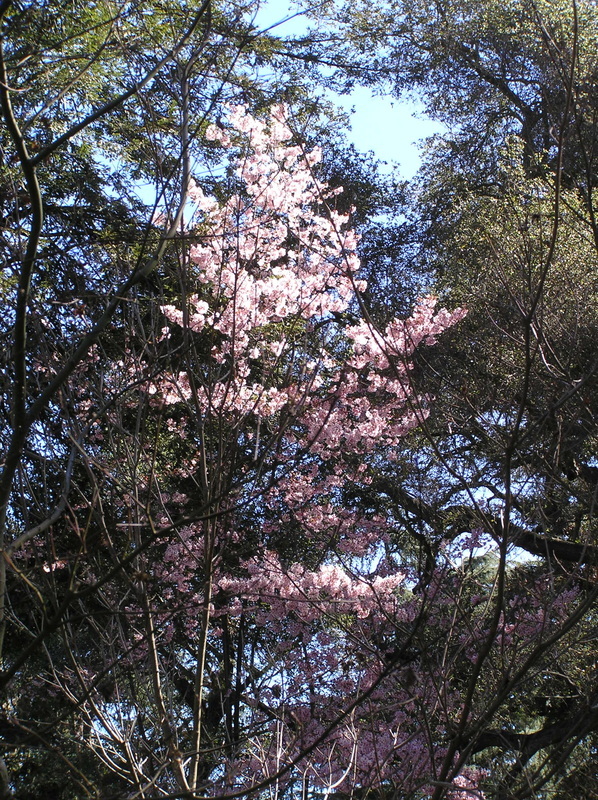 The combination of these cherry blossoms, new green leaves and the sky blew me away. Gardens don't have to have flowers to be colorful and interesting. The sun hitting the top of this cherry tree made it glow. This striped camelia stood out stood out among the solid colored flowers. I got down on the ground to photograph this red camelia against the sky. 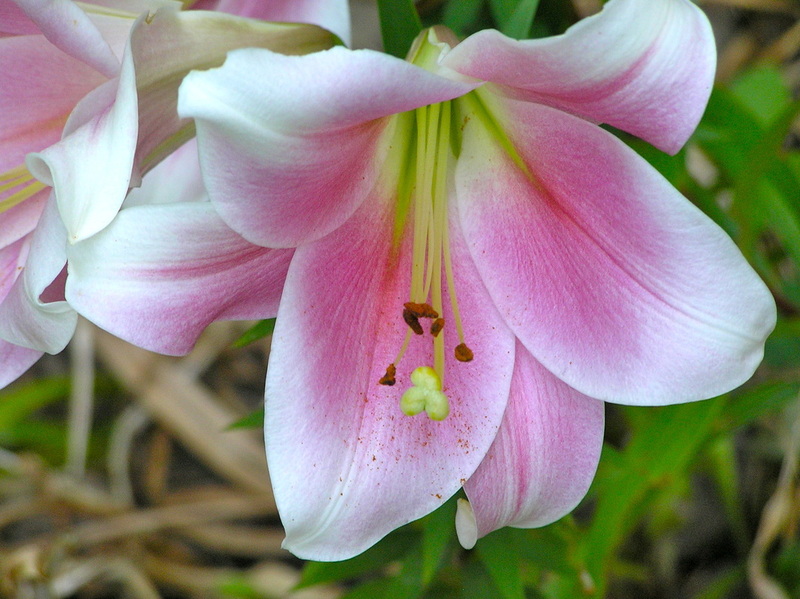 If I got down on the ground and back up again, you are going to look at this flower. I thought the shading on this camelia was exquisite. I have no idea if these camelia blossoms fell upright into the calla leaves or if someone had fun placing them there. I hope someone had fun. I love how the morning light highlights the leaves of this bird of paradise. 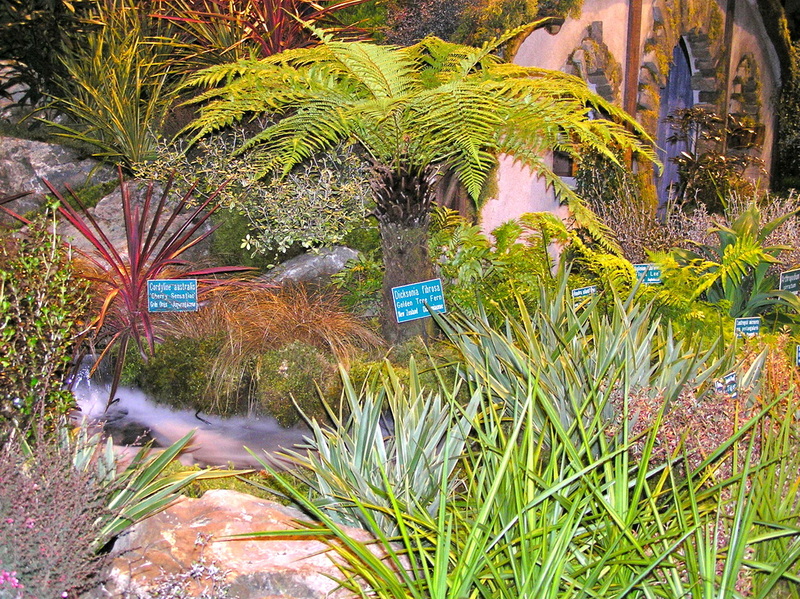 the Northwest Flower and Garden Show. I loved this informal combination of grass and flowers with the contrasting colors. I loved this gate. James Curtis from Edge of Glass Gallery was the glass artist for this piece. This is the Hobbit House exhibit sponsored by the Washington Arboretum Foundation. These pictures are from my own yard. Mama duck is the white one with her head hidden. She just turned ten or eleven years old. She is queen of the flock. 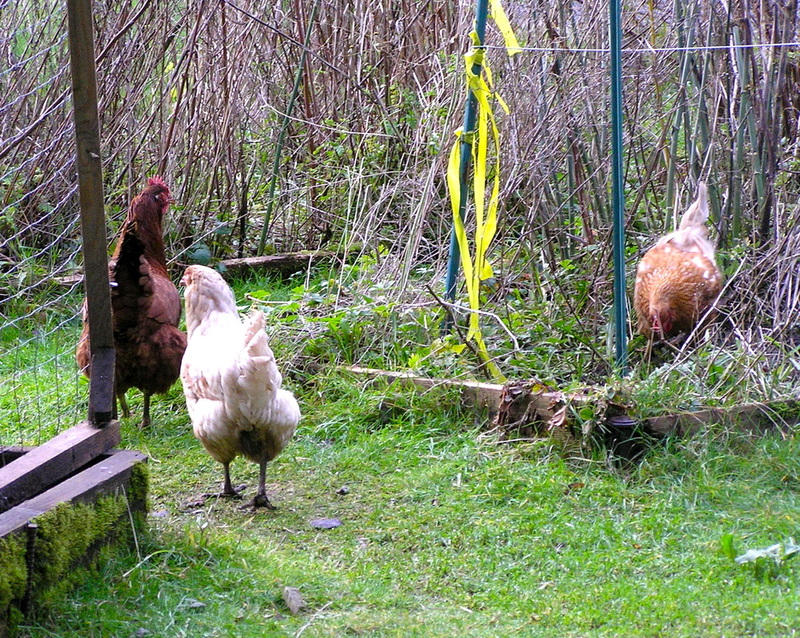 On the right are my chickens. The Little Red Hen is, of course, the dark red one. Chicken Little is the whitest one in front, and Henny Penny is off to the right with a copper colored head. Poultry is so soothing in the garden.